We strongly recommend purchasing dive accident and travel insurance for your trip. In order to maintain our reasonable cost and high level of service, we do not automatically insure your trip against the adverse effects of weather or other factors beyond our control. Your holiday represents a very large investment, and unforeseen circumstances such as named storms, injury or sickness, airline issues, and family emergencies can easily affect your ability to travel. Diveassure: For annual combination trip and dive accident insurance. Divers Alert Network: For annual combination trip and dive accident insurance. Travelex: Travel protection for a single trip. You may choose the TRAVEL SELECT policy and select the optional ADVENTURE SPORTS COVERAGE upgrade which waives the policy exclusions for extreme sports such as scuba diving. What is a dive liveaboard like? Dive liveaboard cruising is an appealing alternative to conventional land based dive vacations and larger cruise ships. We offer a richer travel experience – one that goes beyond the typical tourist sites. Aboard All Star Indonesia – Aurora you’ll get to experience delicious meals and great diving along with optional included shore excursions and eco adventures. We offer multiple itineraries with various lengths. Raja Ampat and Komodo are two seasonal areas with Forgotten Islands, Banda Sea, Alor and Maluku offered between the two seasons. For more details, go to the Itineraries page to read about the itinerary that interests you. We ask that all guests disembark after breakfast on the last day. If you have a flight later in the day, you can remain on board, but clear your cabin out and linger on the deck or in the salon until your transfer time. Can you recommend hotels for extended stays or early arrivals? Yes, we have a list of hotels that are convenient to the dock in each port of boarding. Most travelers plan to arrive at least a day early to acclimate to the time change and allow for any travel delays. Click here for a list of Indonesian hotels. All travelers to Indonesia need a passport. It must be valid for at least 6 months from date of entry into Indonesia. For visits under 30 days, and for pleasure, no visa is required to visit Indonesia. Are there any arrival taxes? Yes, there are arrival taxes but they are included in the price of your airline ticket. How do I get to the dock? Aurora will arrange transfers to and from the dock and airport only. Hotel transfers to the dock are not included but can be arranged for you. Light clothing, bathing, suits, t-shirts and light windbreaker for cooler evenings. Walking and hiking shoes for land excursions and a sarong for women when visiting villages. Click here for a checklist. Jakarta is 12 hours ahead of New York City. Raja Ampat is 14 hours ahead of New York City. Komodo is 13 hours ahead of New York City. Domestic flights in Indonesia carry a 44 pound (22 kilo) weight limit per bag. You are allowed an extra bag for scuba diving gear on Garuda Airlines but not any other carriers. A fee per kilo overage is levied by the airline and be prepared to pay this in cash with Indonesian Rupiah. The fees include port tax and dive permits for the Marine Park. These fees are payable on board when you check out. Consider paying in Euros or dollars. Credit card payments incur a fee. What is the minimum age on the Aurora? The minimum age is 16 years and must be advanced diver with 50 dives logged prior to boarding. What is the deposit for a trip on the All Star Indonesia – Aurora? We require a deposit of 30% of trip value within 7 days or reservation and full payment is due 120 days prior to departure. We accept MasterCard, Visa, and Discover, personal check, money order and wire transfers. More than 9 months from departure, a refund less 5% cancellation fee. Within 9 months of departure, no refund is issued. As unglamorous as it sounds it’s really fun for divers that enjoy finding the little things. Muck diving is usually done at the bottom of the ocean with a sand or sediment base where all of the small macro animals live and hide. This is heaven for macro photographers. Look for small shrimp, nudibranchs, juvenile crabs, frog fish and small octopi and many other camouflaged critters. It’s really important to keep fin action to a minimum as to not stir up the bottom. How many dives are offered per day? 3 dives per day plus night dives will be offered during your cruise. No diving is offered on the first and last day. How many night dives are offered? Night dives will be offered as often as possible. We travel during the evenings and there is no night dive on the first or last day. What level of dive certification is required? Advanced open water (AOW) certification is required with at least 50 dives logged prior to arrival. AOW can be obtained on board with prior arrangements. Yes, for a fee of $12.00 per day and based on the number of dive days in your itinerary. How is the diving conducted? All dives are from our tenders and small groups of divers plan their dive with an instructor that is assigned to them. Yes, all dives will be led by one of our instructors. Only in exceptional cases will buddy diving be done independently. What size tanks are available? We dive with 80 CF (12L) tanks. 100 CF (15L) tanks can be arranged for a fee of $10.00 per day. What type of valves are on the tanks? DIN or Yoke? The tanks are equipped with yoke valves and we have DIN adaptors available. The sharks of Indonesia are exotic! Look for the wobbegong sharks in Raja Ampat and whale sharks, hammerheads and whitetips as well. Can I rent dive gear? Yes, with prior arrangements, we can supply buoyancy compensators, regulator sets, computers, dive lights and wetsuits. Wetsuits are available in 3MM shorty only. Please request these items on your Trip Application. Payment can be made while on board. Wetsuit needs are very personal so we provide you with the water temperatures in each area. Komodo trips offer diving in both north and south. The water temperatures there vary greatly so be prepared for both warm and cooler water temperatures on this itinerary. What are the air and water temperatures there? Is any special dive equipment required? All divers are required to carry a dive light and a safety sausage. Can I come on a trip without a buddy? By all means, yes. There will always be a diving buddy for you. Many of our passengers come aboard as singles and it’s a great way to meet other likeminded adventure travelers who love to dive! What are the meals like on the All Star Indonesia – Aurora? Lunch and dinner are served buffet style with entrée choices, vegetable, starch, salad and dessert. A continental breakfast is available before the first dive. After the first dive a full made to order breakfast is served. Snacks, fruit and treats are offered throughout the day as well. What if I have a special dietary request? Vegetarian, vegan and gluten free are pretty easy to work with as well as allergies so let us know upon booking if you require special meals. Please remember that you are participating in an adventure travel vacation that is occurring in a remote part of the world. Many of the modern conveniences, brands and pre-packaged goods we use at home are not available in remote destinations. As such, many special requests that are very specific may be difficult to accommodate. Finally, if you are celebrating a birthday, anniversary, or other special life event, please let us know. Our crew stands ready to assist you in making your special day something to remember. No, we do not offer connectivity on board. You may use your cell phone data plan when in cell range. What type of adventures can I look forward to on my cruise? Depending on the area and itinerary, we offer islands visits to local villages, indigenous animal encounters (Komodo dragons and Birds of Paradise and bats in Raja Ampat, to name a few), snorkeling adventures, kayaking and island hikes to scenic overlooks. How can I recharge my electronic equipment? 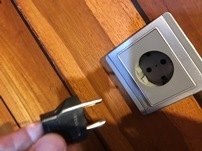 Outlets are all European with 2 round plugs, bring your own adaptors to use electronics from home. We recommend you travel with U.S. dollars and suggest you purchase some Indonesian Rupiah for payment of luggage surcharges and any incidentals. Will my cell phone work in Indonesia? Only in major cities and tourist destinations. Be sure to arrange an international calling plan with your provider prior to your arrival. How big is the All Star Indonesia – Aurora? She is 131-foot long with a 30-foot beam. She has two levels for living space and over 3,000 square feet of sail! We can accommodate 16 guests in 8 private fully en-suite cabins. Yes, each cabin has its own climate controls. All cabins have a private bathroom. Each bath has a sink, mirror, head and shower. Water, soft drinks, Nescafé and Bali coffee, juices and sodas are included. Alcohol is available for purchase and range from approximately $4.00 – $5.00 for beer, $8.00 – $9.00 for a cocktail and up to $50.00 for a bottle of wine. A variety of wines is available on board for you to choose from. You may also bring your own aboard if you wish. Can I drink the water on board? Yes, we have water makers on board capable of keeping up with the consumption. Of course, we ask all guests to be conservative when showering. Is there a TV on board? Yes, for videos and DVDs only as we have no service for network channels. Is there a computer on board? We have one computer for guests to use for downloading files. A USB thumb drive works best for traveling. Smoking is permitted on the aft deck only. Please do not throw butts overboard, there is a receptacle for your use. Yes! The sun’s rays are very strong year-round so bring lotion, hats, sunglasses and UV clothing. We do offer a sun shade over the top deck when needed. English is spoken in tourist destinations and on board. How many crew members are on board? The captain, cruise director and up to 16 Indonesian crew members are there to ensure you are well taken care of during your stay. What other expenses might I expect on board? Fees are payable on board and vary by area and length of stay. Raja Ampat fees: $130.00 park fee & $200.00 port/fuel – per person. Komodo: $20.00 park fee per day, no port/fuel fees for Labuan Baja, Bima or Bali. Bali departures add $200 port tax – per person. All other areas: $75 park fee plus $200 port/fuel fees – per person. Is laundry available on board? Yes for a fee. Large items are $2.00 and smaller items are $1.00 each. What other services are available on board? SAT phone calls, nitrox use, alcoholic beverages, laundry service, rental gear with prior arrangements and boutique items. Yes, feel free to bring a beach towel if you have room to pack one. Can we listen to music on board? Yes, we have an iPod docking station so bring your favorite tunes for everyone to enjoy. What is the recommended tip on board? Tipping is common practice and a welcome part of Indonesian life. We recommend 10-15% of trip value. What if I need to be reached in an emergency? If someone needs to get in contact with you because of a true emergency, they may contact our U.S. Reservations Office and we will relay the message. Keep in mind that the boat will be in remote areas and any interruption will cause missed diving so be sure this is a true emergency. The captain has a SAT phone that is enabled each day for an hour to receive important messages.